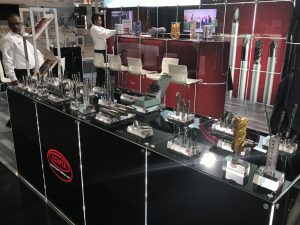 Whilst Somta Tools has exhibited on numerous occasions at EMO, this show reflected a quantum change in interest and potential due to the fact that this was the first time the company had exhibited as a member of the OSG group. 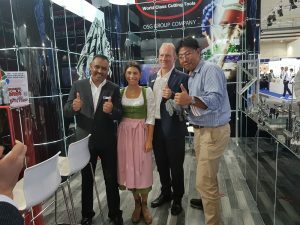 In addition to the normal interaction with existing customers, the Somta booth was inundated with visits from OSG sales teams and their customers, from various countries. 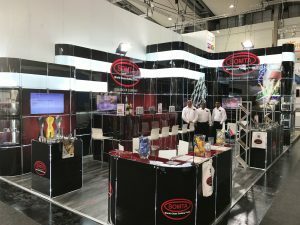 The exciting energy created an unprecedented ‘buzz’ on the Somta booth, which in turn attracted other visitors who normally would have walked by. 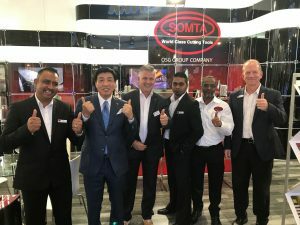 OSG will be promoting the Somta product range, under the SOMTA brand, worldwide through their 30+ sales offices – with the Somta range complimenting that of OSG and allowing for much greater market coverage. 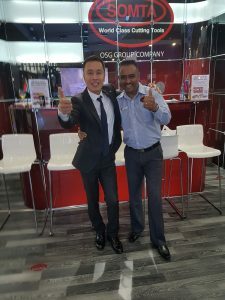 This show underlined again the significance of Somta being a part of the OSG family, not only through the extended reach and synergy, but also because of the immense credibility that goes with the OSG brand. Also exciting was that Somta had 3 of its team visiting EMO for the first time. Shaun Roopnarain (International Sales Manager), Farouk Ismail (international sales) and Dilon Mathavalla (Engineering Manager) were all blown away by the size of the show, the technology on display and the number of competitors in our industry – a clear reminder of the value of being part of the world’s largest industrial exhibition. There is always a healthy mix of emotions – ranging from exhilarating to intimidating! 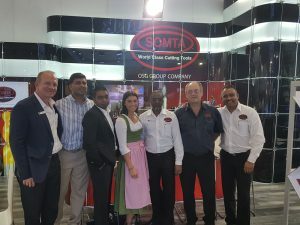 As the only exhibitor from Africa at EMO, Somta was also privileged to have many of the visitors from South Africa visit its booth and develop growing relationships. There is a lot to do together to develop manufacturing in South Africa and create jobs. By the end of the show, Somta had visits from over 150 Customers (only 20 of which were existing), representing 47 different countries. 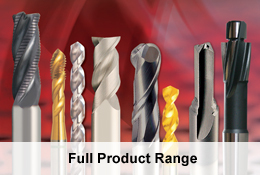 The company has many new exciting leads for the sales team to follow up on. The Engineering team also came back with some fresh ideas and challenges of how to take the company into the future in terms of technology and best manufacturing practises. It costs a lot to exhibit at EMO, but this is one show that we believe will reap many rewards.